The library was first set up in a church school on the site of the present Congregational Church about 1842. About 13 years later, a group of citizens met on September 5, 1855 to plan the formation of an organized library with reading rooms and lectures geared to the mental development of its citizens. This organized library was then called the Young Men’s Literary Association of Geneseo. The second story of the Merriman & Crawford Bank was the first real—not makeshift—home of the library. Later, fire damaged not only these rooms but destroyed some of the collection. The library moved several more times into various locations in the business district.The public was cordially invited to meetings, which were held, every two weeks. These meetings were actually lectures from out of town guests or discussions based upon predetermined questions. Membership to this Association was at a price of $1.00 initiation fee and quarterly dues of $.50. Those living in Geneseo and vicinity were eligible for this membership. These membership funds bought the first books and periodicals made available to its membership. Between the years of 1855 and 1881, the YMCA and the WCTU (Women’s Christian Temperance Union) additionally sponsored the library, respectively. In 1881, after the city agreed to the plan, it procured a charter, appropriated $800 for expenses, rented space above another downtown business, and hired a librarian for its first city library. In May 1888 the library was changed from a city to a township library increasing funding and its “power of usefulness.” Geneseo then had its first Geneseo Township Public Library (also known as the George B.Dedrick Public Library of Geneseo Township). It was moved again, still downtown above another established business. In 1898, Mr. & Mrs. Joseph Hammond gave $10,000 for the purpose of building a proper library with furnishings for residents. More funds were raised by citizens through subscription for a site for the building. Through the ensuing years many interested citizens donated books and equipment. The year 1965 found the library bursting at its seams. More space was necessary. Several years followed with respective Boards vying alternative solutions to their dilemma. The Library Board of Geneseo finally made the decision to build new. It was in 1976 that the library collection, along with some original furnishings, was moved to a new building, right next-door at 218 South State Street. This building was named after George B. Dedrick, a long time Library Trustee; the meeting room was deemed the Hammond Room to honor the Hammond family. The “old” library housed the Geneseo Historical Association Museum for the next few years until 1998. The Geneseo Historical Association then purchased a building across the street at 205 South State Street. The Geneseo Public Library District used the old library building for storage until the trustees sold the building in September of 2005 to Theresa Jones, of the law office White and Jones, for a sum of $85,000. The history of the library has always exhibited a steady growth. The library collection or holdings have grown from the original 1,100 volumes in 1881 to well over 45,000 by 2009. 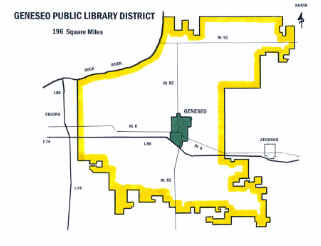 In 1987 the library changed from a township to a district library in an effort to serve more of its surrounding area and citizens. The library is controlled by the election of a 7-member board of trustees and State of Illinois Statutes (laws), which are set specifically for governing district libraries. When the library became a district library it doubled the population which it served in the townships from 6,603 in 1970 and 7357 in 1980. As stated before, the library now serves a population of 13,102. 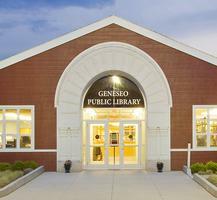 The library has not been affiliated with the city of Geneseo since1888. In 1966, the library joined the Western Illinois Library System (now the Alliance Library System). The library later became a member of the River Bend Library System in the early 90’s (1991), having transferred from Western Illinois Library System. The River Bend Library System merged with two other existing library systems to become the Prairie Area Library System. Over half of the District’s population holds library cards. Proof that reading, education, and the library are important to the citizens of this area. The library has continued to progress throughout the years. By 1910 the library housed 12,000 volumes. By 1986, the collection numbered 35,750 volumes. Now, the collection is well over 45,000. This collection is managed by an automated circulation system, which was added in 1992. This system acts as the card catalog, and also as check-in, and checkout for the materials you wish to borrow. It also maintains a confidential database of your vital information, which is needed for our use only. In the ensuing years, the library brought a great amount of computer services to patrons for ease of check-in, checkout, placing holds from home, reciprocal borrowing, word-processing, Internet searching, and e-mailing all over the world. Due to technology growth and collection growth the 1976 building on State Street soon outgrew progress and a new one story $2.5 million building was constructed at 805 N. Chicago Street, Geneseo. The new library opened on October 1, 2011 and was entirely funded with private donations from community supporters.